Harvest Gold Memories: Bye Bye, Darling. Death of Zsa Zsa Gabor. Bye Bye, Darling. Death of Zsa Zsa Gabor. On December 18, 2016, we lost celebrity Zsa Zsa Gabor (see her obituary at http://lat.ms/2hJBnpL, note that she changed her name from Sari to Zsa Zsa), a Hungarian-American celebrity, who began her celebrity existence with a title of Miss Hungary in 1936. In 1941, shortly before the Russians installed a puppet government in Hungary in 1943, her family fled the country and ultimately ended up in the U.S. Her parents were both of Jewish ancestry (although they were reportedly not adherent to their faith), necessitating their immigration from Europe in World War II. She was the last of the three famous Gabor sisters to die: her sisters were Magda and Eva, each of whom became celebrities in their own right. Zsa Zsa was considered the epitome of twentieth-century glamour and celebrity, but it's the twenty-first century now, and Zsa Zsa's later years were not especially kind to her. Her famous catch-phrase was to call everyone "darling" in her distinctive Hungarian accent (which came out "dah-link"), usually because she had forgotten or never bothered to learn their names (often because of alcohol-induced intoxication). 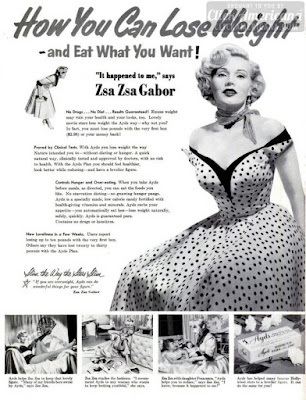 1953 Zsa Zsa ad for weight loss supplement "Ayds"
Zsa Zsa's older sister was Magda Gabor, and she was perhaps the least famous of the three Gabor sisters (she passed away in 1997), and her younger sister was Eva Gabor (and considered to be the nicest and perhaps most talented of the Gabor sisters, perhaps best known for her TV role as Lisa Douglas on the late 1960's TV sitcom Green Acres and vocal talents as Miss Bianca in Walt Disney's 1977 animated movie The Rescuers, and she also operated a very successful wig business; but she passed away in 1995). What was the Gabor's appeal? Zsa Zsa was even more famous for her off-screen antics than for her entertainment talents. She was married nine times, and her only child Francesca resulted from her marriage to the late hotel magnate Conrad Hilton (Francesca died at the age of 67 in January 2015). In Zsa Zsa Gabor's 1991 memoir "One Lifetime Is Not Enough", she claimed the baby had been conceived after she was allegedly raped by the hotel tycoon. But her marriage to Mr. Hilton was also reported to be one of her only marriages that was not for love, but for money, so we may never really know. In 1989, Zsa Zsa (in)famously slapped a Beverly Hills police officer in the face and yelled vulgar obscenities at him from her Rolls Royce, and she even spent some time in prison for that incident. The judge stated that she already had a prior criminal record, adding that Ms. Gabor had been convicted in Britain of hitting another police officer with her purse, and was fined $5,000 for that incident. In 1991, Zsa Zsa Gabor appeared on daytime talk-show The Phil Donahue Show to promote her then-new autobiography, which we know was ghost-written on her behalf. But by that time, it was really a tell-all about her many lovers and marriages. She denied sleeping with them all, and often joked about never sleeping with a man unless he agreed to marry her first. In 1994, she and TV talk-show host David Letterman drove around Los Angeles stopping at different fast food joints (see a clip at https://youtu.be/fEn8QdI8-24 for more), which kind of epitomized her self-mocking celebrity humor, especially in her later days. 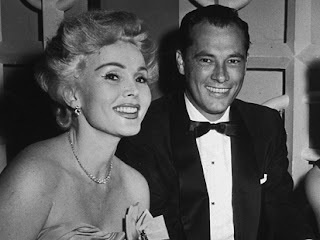 Zsa Zsa Gabor did have some legitimate 'acting' credits (although mostly cameo appearances) to her name, having appeared in some 40+ films, including both American and European films, starring as herself in the movie A Very Brady Sequel in 1993, as well as a number television movies and TV shows (including an appearance on the sitcom Gilligan's Island in 1965, on Batman in 1968, as a cast-member on the soap opera As the World Turns in 1981 and on the sitcom The Fresh Prince of Bel-Air in 1991 to name a few, see more by visiting http://bit.ly/2hSVVMr). Perhaps her most famous acting credit was for the original 1952 film production of Moulin Rouge. But she was never considered true, Oscar-worthy acting talent, and to her credit, she often parodied herself in some movie and TV appearances. According to her longtime publicist, the official cause of her death was heart failure, but TMZ reported that she had a heart attack. At the time of her death, Zsa Zsa Gabor herself was reportedly age 99 (we now know her actual date of birth was February 6, 1917), although throughout her life, she routinely lied about her true age, so the public was always left to speculate about her real age. But we know that prior to her death, she had been in a steadily declining state of health. She suffered head and other injuries which left her in a wheelchair, and then suffered a stroke in 2005. In 2010, she underwent hip-replacement surgery, but in 2011, her right leg was amputated above the knee in order to save her life from an antibiotic-resistant infection. Whether Zsa Zsa Gabor will be remembered for much outside of her narcissistic, gold-digging behavior will only be seen over time. But while she was alive, she certainly made a name for herself, and lived her life to the fullest.